The Lodge at Giants Ridge is an all-suite Northwoods resort and conference center located in Biwabik, Minnesota, midway between Duluth and Ely. The Lodge features 67 guest suites ranging from one to four bedrooms, the Sleeping Giant Restaurant & Bar, the Little Giant Arcade, a large indoor pool and hot tub, a salon spa, and meeting and event spaces to accommodate groups from 20 to 350. The Lodge is conveniently located at the heart of the Giants Ridge Recreation Area, home to the best selection of outdoor recreation amenities Minnesota has to offer. Two of the nation’s highest-ranked public golf courses, the Legend and the Quarry lie to the north and south of the Lodge. An outdoor climbing wall and alpine, cross country, mountain bike and hiking trails are all literally right out the Lodge’s back door. 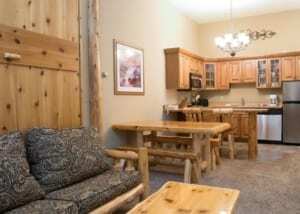 Hundreds of miles of snowmobile, ATV and paved bike trails can be directly accessed from the Lodge. The state’s only Off Highway Vehicle Park, featuring 35 miles of off-roading adventure for ATVs, side-by-sides, Jeeps and dirt bikes is just 7 miles away in Gilbert. There’s something for boaters and paddlers, too. Sabin, Wynne and Mine lakes are within ¼ of a mile to 3 miles of the Lodge, and all feature public boat launches with ample trailer parking. Spacious one-, two-, three- and four-bedroom suites feature log furniture, rustic décor and separate sleeping and living areas. 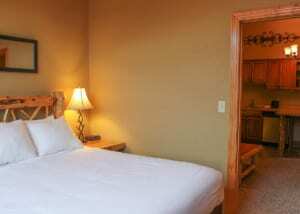 Includes a private bedroom with a king-sized bed, a pull out sofa or futon in the living area, and one bathroom. Sleeps 4. Includes one private bedroom with a king-sized bed, one private bedroom with two double beds, a pull out or sleeper sofa in the living area, and two bathrooms. Sleeps 8. Includes one private bedroom with king-sized bed, large jetted tub, and private bath, one private bedroom with king-sized bed, and one private bedroom with two queen-sized beds, a sleeper sofa or futon in the living area and one additional bathroom. Sleeps 10. Includes four private bedrooms and two full bathrooms. The master bedroom features a king-sized bed, large jetted tub, and private bath, a second bedroom with king-sized bed, a third bedroom with one queen-sized bed and one twin-sized bed, and a fourth bedroom with two twin-sized beds. 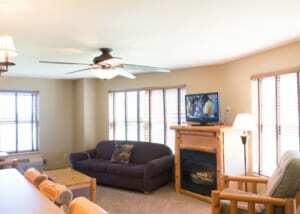 The living area also has a sleeper sofa or futon. Sleeps 11.